If you've been banned from Modern Warfare 3, you can start playing again in another 5,000 days. If you're not playing nicely with others in Call of Duty: Modern Warfare 3, Infinity Ward has revealed that it's got no problem banning you from the game. What's kind of hysterical, though, is that even though these bans are pretty much permanent, they're being labeled as "temporary" - even though they last for 13.5 years. These bans are set to last for 5,000 days ... meaning you can play the game with your friends again if you're willing to wait for over a decade. 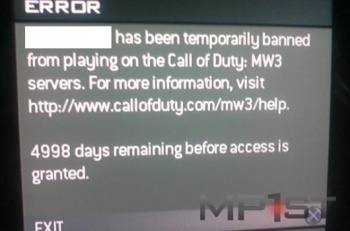 Infinity Ward Creative Strategist Robert Bowling confirmed the bans when he confirmed the truth of this image, stating "If you see this message, it means you've been Permabanned (for something bad)." Personally, I think this is pretty funny; it's reminiscent of some of the posts you'll find over at Why Was I Banned? One has to wonder, though, how the folks at Infinity Ward actually came up with this length of time when they were deciding punishment lengths.